Once all the soaps are on the rack and curing, and the 400+ tubes of lip balms have been labeled, banded, and portioned off to go to their respective customers, it’s time to whip up some edible concoctions as the nights turn chilly and we want heartier fare. Yet, as I create soups and one-dish meals, I can’t quite give up the light, bright, fresh flavors of summer; I just warm them up a bit with certain herbs and spices. We warmed up with tomato basil bisque this weekend, accompanied by grilled cheese sandwiches, because, really, can it get more comforting and warm than that? I had a few parts of this recipe prepped already from last year’s canning extravaganza, which made it a bit easier to throw together. It’s full of fresh or frozen veggies, basil fresh from my garden, and zesty Italian spices. The soup happily bubbling and cooking down the excess liquid. Smells amazing! I started with frozen tomatoes I had leftover from last year, sliced some fresh onion, and used fresh organic carrots (naturally much sweeter than conventional) that I sliced very thinly. 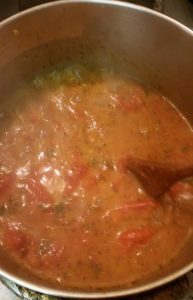 The tomatoes were very juicy, so I added some powdered dehydrated tomato peel to the liquid to thicken it and increase the tomato flavor with a POW! At the end of all this, I hit the whole concoction with an immersion blender to make a lovely creamy soup with a little texture to it. Melt butter in a sauce pan. Add chopped onion and shredded carrots. Cook 3-4 minutes until soft. Add flour, a little at a time, stirring it in until it’s absorbed. Gradually stir in milk; let mixture cook for two minutes. Add tomatoes, basil, salt, and Italian seasoning. Let cook for 15 minutes. In small batches, blend soup using either an immersion blender or a conventional blender, processing until mostly smooth. Serve hot. Makes 4 servings. 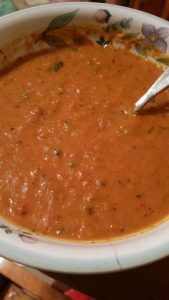 *My frozen tomatoes had a LOT of liquid when I thawed them, so I poured out a cup of the liquid (there were 1 1/2 cups total) and gradually added 1/2 cup of dehydrated, processed-to-powder tomato skins to the liquid, stirring after each addition. I let this sit for 3 minutes before adding it to the thickened mixture. This ratio made a good sauce and increased the rich tomato flavor. You can dry tomato skins in a food dehydrator, oven, or microwave; there are some great instructions online. Bowl full of warm, comforting goodness! Mostly creamy with a bit of texture for bite. Doesn’t that look amazing? I was so pleased with this, and best yet, I have one more quart of tomatoes in the freezer, so I can make it one more time. If you want the juicy nutrition deets on this soup, you can find them here. (There is one little error in the recipe; it only makes 4 servings, where I’d put 5 in the one I submitted at Spark Recipes.) It’s a bit of work, but so worth it! Enjoy! It’s not that cold here, thank goodness. In fact, it’s still warm enough to enjoy fresh tomatoes and fresh basil, sun-warmed out of the garden. After purchasing 30 pounds of tomatoes last weekend and putting most of them up hot-packed, I still had a dutch oven full of peeled, quartered tomatoes. What was going to be more hot-packed tomatoes ended up turning into the most fabulous tomato soup I’ve ever had. After tormenting my Facebook friends with pictures of our dinner Saturday night, I thought it’d be only kind to share my recipes with them and with you. First up, my homemade Tomato Basil Bisque. In 3 qt. saucepan, heat butter over medium-high heat. Add onion and carrots, cooking 3-4 minutes or until soft. Add flour; cook and stir until moistened. Gradually add half-and-half, cooking and stirring about 2 minutes until smooth. Stir in remaining ingredients. Cover; cook for 15 minutes just until coming to a boil, stirring frequently. Can use 2% milk. When I made this, I made my own tomato sauce from cooked down tomatoes, adding 1 tsp. salt to that. I also used fresh tomatoes instead of canned. I added ½ tsp. salt and 1 T. of Italian seasoning to the soup. It was a tad too salty, though, so I recommend adding only 1/2 teaspoon of salt to the homemade sauce. I found a pouch of this Italian seasoning blend in the pantry that I’m going to use next time. I made that bisque to accompany these Chicken and Cheese Stuffed Shells. These feature my homemade pesto, made from basil I harvested from our garden. I still have at least 6 thriving basil plants and 6 plastic pint containers of pesto in the freezer. It’s going to taste like summer all winter! Cook shells according to package directions; drain. While the pasta is cooking, combine 1/3 cup cheese, all the chicken, and ¼ cup pesto in a bowl. Fill cooked shells with chicken mixture and place in a 9”x9” or 11”x7” pan. Top with remaining cheese. Bake for 5 minutes at 350o, or just until cheese is melted. After removing pan from oven, cover shells with pesto. Let sit for 5 minutes to warm the pesto. When we’re not making soap, we really love to experiment in the kitchen, trying out delicious, easy, inexpensive dishes that are well-suited to our busy life. I’m hoping to make up some of that bisque (minus the milk) to can for the winter. Pinterest can be my worst enemy. Pictures of lovely architecture, House Beautiful-worthy living rooms free of clutter and toys. Clever organizational tools put together from thrift store finds. And all this from home educating moms of seven kids who seem to be able to do it all. Seriously, Pinterest is not the website for the insecure. Our living room is cluttered – painfully cluttered. The girls don’t seem to understand the basic concept of “pick up after yourself when you’re done.” It gets cleaned about three times a year. Other than that, though, I think we are doing well. I never really expected to be doing anything like homesteading. but over the weekend, I was told that I am enviable. OK. That’s pretty nice, though I never expected to be. We had another weekend of glorious productivity. It started with restocking these beer soaps. On the left (the greyish green) is all natural basil and lime. Essential oils of Thai basil and lime blend together in this delightful blend with notes of licorice, pepper, and lime. The tan soap is Sweet Cinnamon & Clove. This was the first beer soap I ever made, and these bars go quickly. These are just a few of the cucumbers that came out of our garden. We ended up harvesting about twelve pounds of cucumbers, all of which became delicious bread & butter and dill pickles. After the cucumber harvest, my youngest daughter and I harvested the first batch of basil for homemade pesto. This was so fabulous on chicken and pasta, topped with home-grown tomatoes! A friend of ours hooked us up with a lime basil plant. I thought, What in the world am I going to do with this? I was looking up basil recipes online and saw one for strawberry basil popsicles. A local indie popsicle business makes something similar, and I thought the lime take on the basil would be delightful with the strawberry. I blended in a bit of vanilla yogurt, and wow!!! It’s like a virgin strawberry daiquiri on a stick! And no weekend would be complete without a visit to the kittens. Momma Cat is doing great, and my kitty co-parent/friend and I were both surprised to discover that she tested negative for FIV, Feline Leukemia, and worms, which is quite miraculous, considering that she was a completely outdoor cat until three weeks ago. The girls and I placed a few kittens on the bed to give the tiniest one of the litter a chance to nurse without “the chubbies” pushing her out of the way. Worn out kitten. I love her little face! I don’t consider myself as that enviable. I am simply a woman who enjoys playing in the kitchen when I’m not making soap or enjoying kittens. Cooking, like soapmaking, is sweet alchemy – taking a variety of different ingredients and putting them together in fun, creative ways to make something new. It’s even more enjoyable when I can make something completely new to me, stretching my skills. The next post will contain suggestions for making DIY easier and doable. I’m not selfish with my recipes, as most of them come from outside sources. Comment if there’s one you’d like. Once upon a time, I was a suited-up professional working in a healthcare environment, punching a (mostly) 8-5 clock. Some days I worked until 7 or 8, and I was on call every single weekend. I was rocking the soap biz on the side, working markets one weekend a month. We lived in a townhouse in a nice urban area and could walk to the grocery store if we wanted. Unfortunately, it was uphill coming back. In fact, making soap was the closest I came to doing the neo-hippie-slash-homesteading thing. A couple of years after leaving that position, it became very clear to us that we were going to be trading urban life for coastal rural life. I was pregnant at the time, so finding a new job wasn’t high on my list of priorities, but making a home was. I had visions of biking places, eating fresh-caught fish on a regular basis, and having our own little garden spot where we could grow our own fruits and vegetables, enough for our family. One out of three ain’t bad. In the six years since we moved, my business has taken off in unexpected ways, and I have changed in unexpected ways. I never dreamed I’d be home educating my daughters. Our “little” garden spot has had really bad years and really great years, but those great years haven’t yielded just enough for us to enjoy, but enough to share. This year, it’s giving us some to can, too. That’s another thing I never expected to be doing – putting up my own canned goods. We tend to gravitate towards condiments (cranberry mustard, jellies, jams, and butters) and dessert stuff (pie fillings and chocolate sauce), although we have made and put up pickles, Brunswick stew, and chicken soup. These, too, we are able to share. Jars of homemade chocolate sauce that Mary made. Taste better than Hershey’s! When we lived “in the city,” I didn’t own a working sewing machine; I’m on my second one since we moved, one that my fellow business owner said is “a good one for children” (thanks, Sarah), but which is most definitely a step up from my Singer. I used to sew; when I was a teenager, I made pillows for myself and for gifts, and I’ve done some of that since being married. My long-time customers have seen the bags I’ve made for gifts or to hold bars of soap, too. I’ve made a messenger bag and three purses. Most recently, I’ve sewn curtains, a rather large project, as they’re covering a sliding glass door. Soapmaking. Canning. Sewing. Knitting. (My oldest daughter is over my shoulder, or I’d show you what I’m working on for her.) I look around at all these things my hands have made, at all the ways I’ve stretched myself to create a warm home and the ways we’ve worked together as a family to achieve it, and I am pleased.